As promised, I’m starting to add dates for upcoming workshops at Clasheen to my diary, it’s taking more time that I thought but at least I’ve finally started to get the ball rolling. To kick things off ‘Naturally Nuno‘ is happening on the weekend of 7th and 8th May, this intimate workshop experience will be restricted to just two participants! Day one of this workshop will concentrate on felting a beautifully soft nuno wrap using the tumble dryer method of felting and day two to the eco printing. No physical rubbing and rolling will be involved during the nuno felting so this is the perfect technique for those of you who find traditional nuno too strenuous on your bodies or possibly just too time consuming! 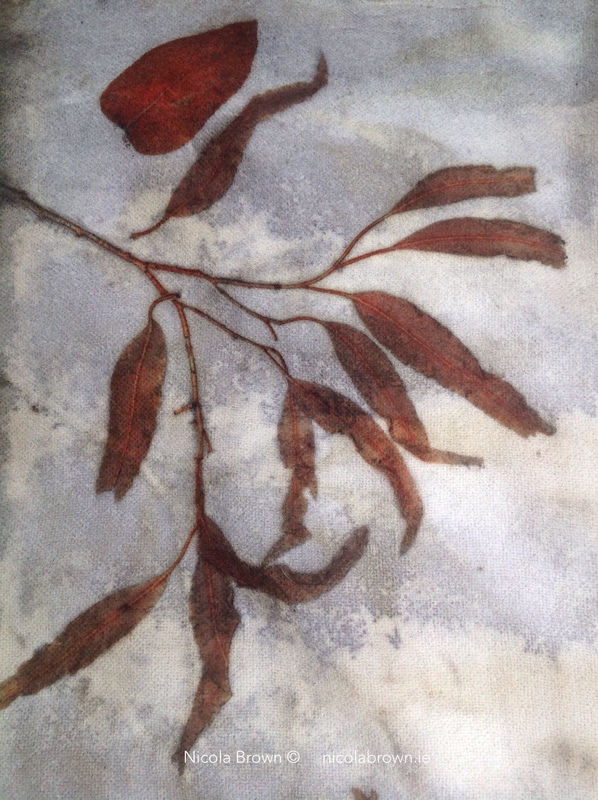 The second workshop that I’ve blocked out in my diary is ‘Successful Eco Printing Basics‘. These May workshops are also the first time that I’ll be able to offer optional simple shared accommodation on site in the newly updated guest suite. This lodging option consists of one double bed and one single bed in a nice light filled bedroom, by all accounts both beds are very comfortable if the friends who’ve already stayed here are to be believed! Next door there’s an adjoining guest sitting room; tomorrow I finish painting the custom built shelving there so by the time of the workshop it should be filled with CDs, fiction and interesting reference books for visitors to browse through. Finally for guests there’s a connecting bathroom with a zacuzzi bath but no shower, those who know me well know my obsession with baths. Here’s one last picture taken in the guest bedroom, the sliding door that you can see here was one of the original doors from when I bought the house. I always wanted to reuse it during my upgrading endeavours as I’d removed the old door frames to open up the space during initial renovations. So when the built in wardrobe (closet) was created to store my completed felt and eco printed textiles Jonathan fitted it to a custom made track, I’m delighted! 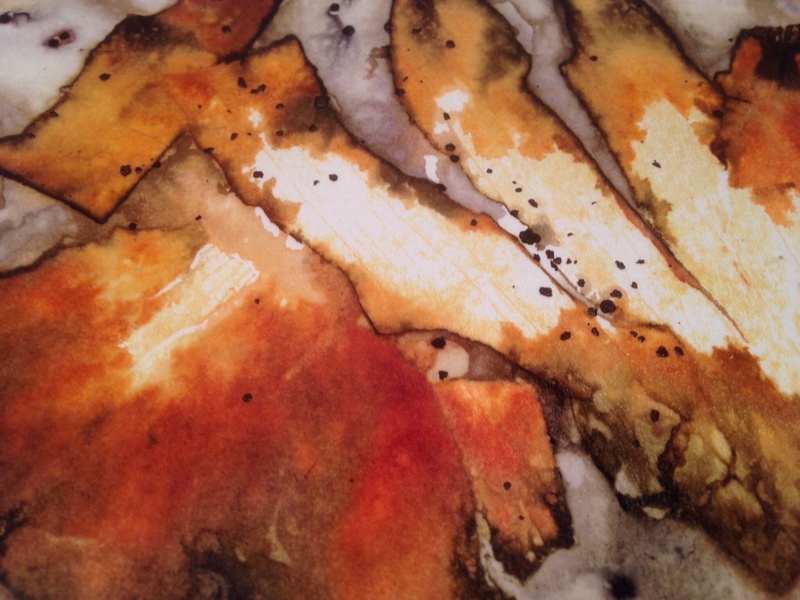 From the personal work point of view I’ve been felting away where possible and printing when the time arises. As soon as the last bit of paint dries on the shelving and the books are brought up from downstairs I’ll be locking myself away in my studio and working on pieces for my exhibition in August! I’ll leave you today with this picture of a piece I felted last week incorporating a base of black merino and a collage of eco printed silk samples. I love how it looks totally at home against the background of the dry stone wall on the lane. Next post……… final images of the ongoing upgrades at Clasheen, new felt in progress and more dates for your diary. 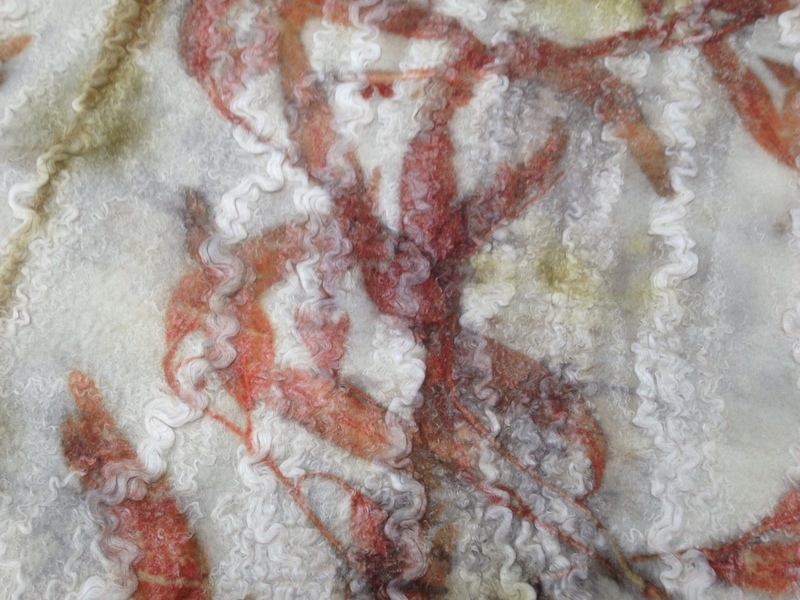 Woo Hoo, the ten day residential felting and eco printing retreat that I’m hosting in July is finally open for bookings! Please check out all the details and various price options here and email me if you’d like to grab a place or If you have any questions. I can’t wait to share this beautiful part of Ireland with you, it’s going to be fantastic fun and July is such a perfect time of year to visit Ireland!!! 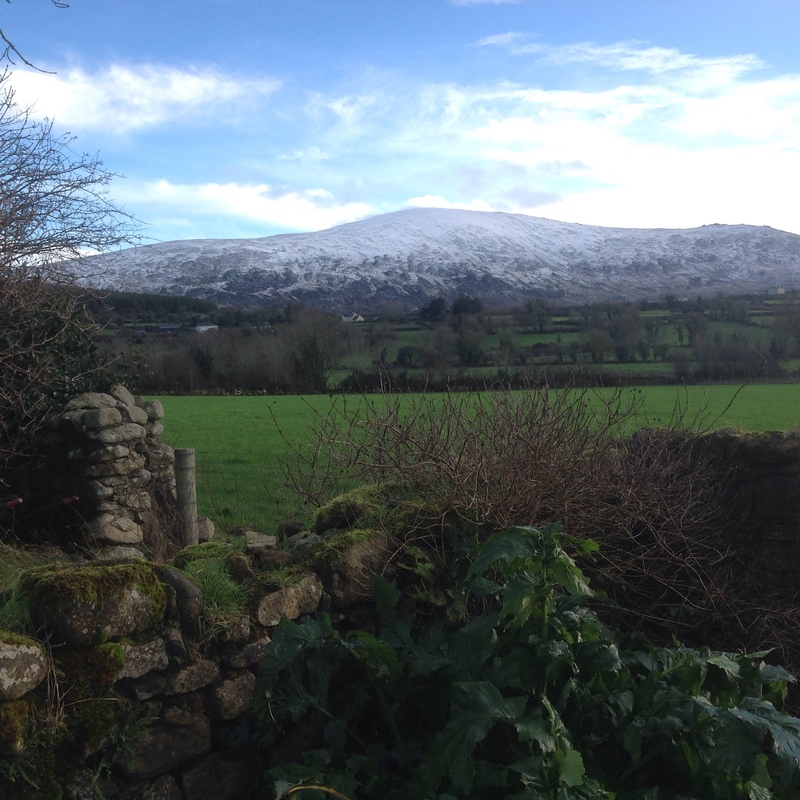 Non workshop participating partners are welcome too, Kilgraney Country House is a gorgeous spot to relax and unwind in and there are a host of activities to enjoy all right on the doorstep. I’ve already hosted the first two eco printing workshops of 2016 and preparations are in the final stages for Creative Island at Showcase. I’ll be on stand C10 for those of you attending, more about this in the next post. For now I’ll leave you with a small selection of images taken over the last few days. I’ve not had much time to blog recently, please bear with me and don’t think that I’m not working quietly away at Clasheen! Here are the most recent updates in brief………..
Felting – finally, after a lot of hard work and frustrated sampling the large felt sculpture I’m currently working on is starting to take shape. It’ll be felted from merino and bamboo fibre, the bamboo adds wonderful sheen and texture to the surface of the felt. 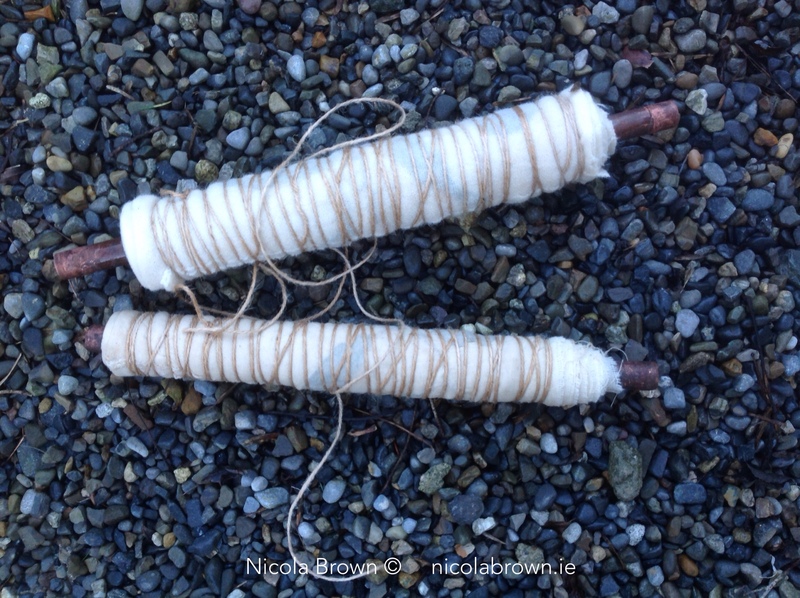 Eco printing – I’ve had a lot of pots on the boil over the holiday season and since the new year. The contents have been mixed, a couple of small felt sculptural pieces, plenty of lovely super fine merino scarves and several batches of paper which I’m printing to incorporate into Showcase invitations. Patrick is working hard on the new website, I worked hard to write and collate a lot of the new information. The website should be live sometime next week, obviously I’ll post here as soon as it is but the blog will link to the new domain name anyway. 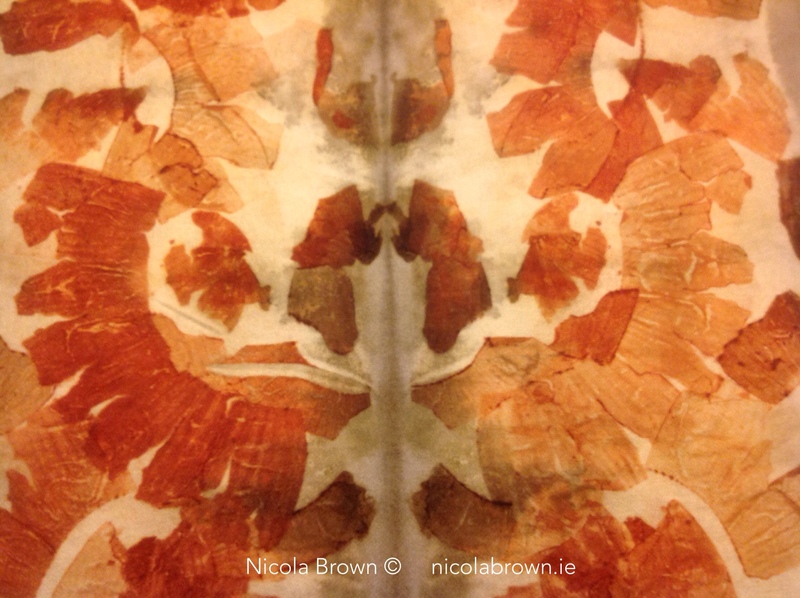 Showcase Ireland – A lot of my work is ready for Showcase but there’s also a lot more to do! I hadn’t fully appreciated how a lot of European companies closed down from before Christmas right through until after the new year. As a result I won’t have any of my new promotional material (with the new website details and new email address) for another few days, cushion liners are somewhere with the courier, silk is on its way, many things are in transit. I’m really excited that Philip Cushen of Cushendale Woollen Mill is weaving a run of lambswool for me this week too, I’ll print it at the weekend and Dorothy will stitch it into cushions at the beginning of next week. 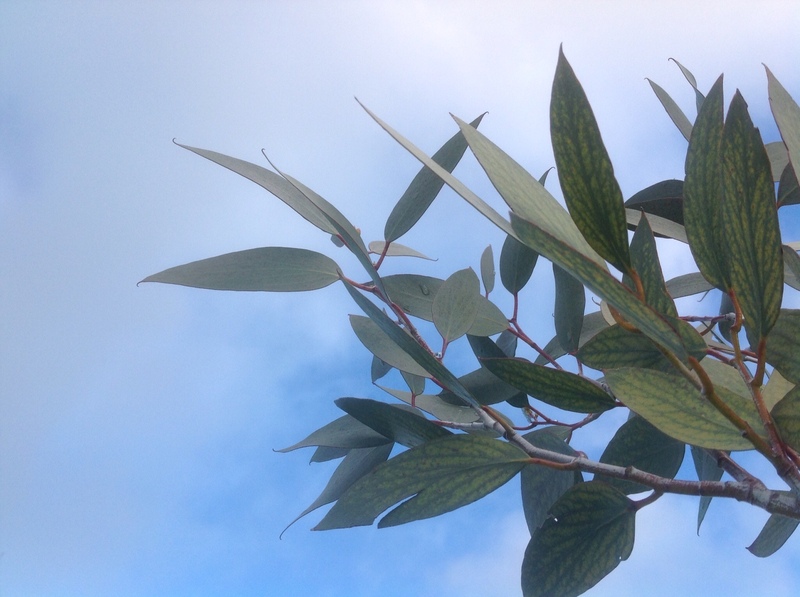 To round things off today I’ll leave you with a picture of eucalyptus leaves against a blue winter sky. This eucalyptus is one of five different varieties I have planted in a grove to the back of the house and I’m interested in the way the leaves have started to change colour, you can clearly see ribs and veins. The three trees of this variety have slso started to get tall so I’m thinking now I’ll have to curtail their growth sooner rather than later, if I don’t I’ll never be able to reach the leaves when I need them for printing! 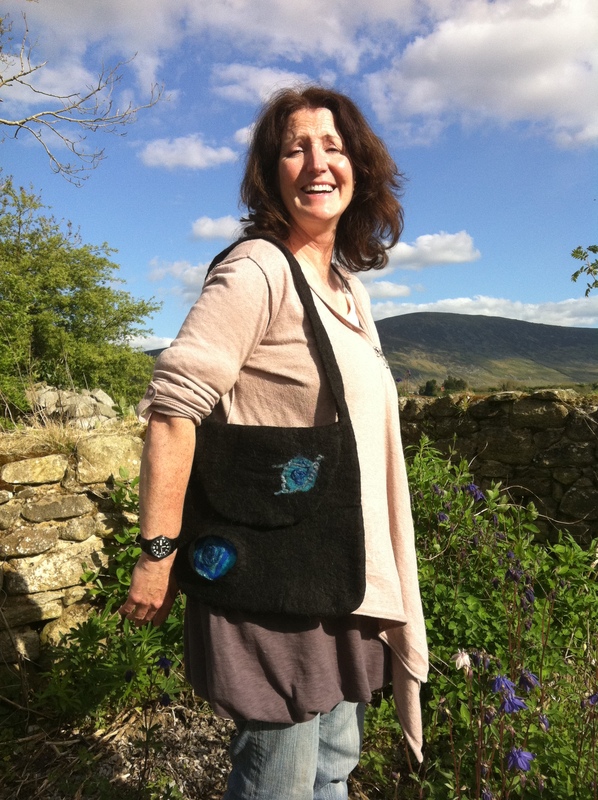 So much felting news to share, so little time ….. I really wanted to write a LOOOOONG post this morning complete with pictures of some recent felt accessories but I still need to assemble my materials for this month’s US workshops, get my hair cut, buy my suitcase, sort out the house, check my diary (ha, ha) to confirm which dates Alan and friends are staying at Clasheen during my travels, wash some clothes, photograph some felt, write a bio and statement (for my first solo exhibition in August), write a profile for a book Feltmakers Ireland are producing etc. etc. etc.!!! Instead I am going to beg your patience and write down today’s essential news as three bullet points reserving a longer post with pictures of the felt accessories for when I have some more writing time tomorrow. Here goes …….. THANKS a bunch to Chrissie who now has the softback version of our book listed on the UK Amazon site, brilliant! Apparantly the more people who ‘like’ the book there, the higher up the rankings it moves so fingers crossed that when people actually have it in their hands we will get some positive responses and it will move upwards. If you are looking for the hardback version it is available (as is the softback too) by clicking on the picture to the right or going directly to our page on Blurb. Congratulations to UK felters Annie and Lyn of rosiepink who have just released their first eBook, I have already ordered and downloaded mine and I love it, the book is titled ‘Creating Felt Artwork’, a step by step guide! Horst has been featured today by felting editor Linda Lanese on the wonderful Craft Gossip website and blog. Thanks Linda for mentioning our ‘Large Felt Garment’workshop which takes place in The Studio, Bennetsbridge, Co Kilkenny, IRELAND from 17th to 19th June, the first time EVER Horst will be teaching outside the US, it will be an amazing experience. In fact, participants who work hard and finish their large garments early will have the opportunity to make a matching bag/purse for themselves, bring it on!!! There are only two places left for this unique workshop so if you would like to join us please email me asap, thanks. Horst's latest line of felt purses! Carmen and I had a wonderful afternoon on Friday for Earth Day! 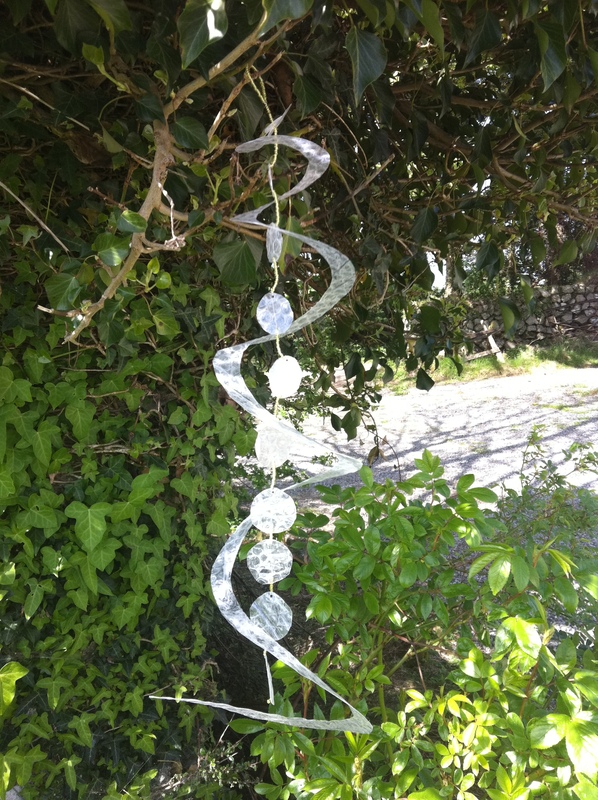 I had been intending on teaching a simple way of making and assembling a mobile out of felt and recycled items, instead I ended up making a mobile purely from laminated bubble wrap and seed beads as I loved the shine of the light on the plastic, it swirls beautifully in the wind! I actually have a new idea now for a similar shaped one made entirely from felt, I think I might need to stiffen the felt to make sure it is light enough but holds its shape, watch this space. For the one I made on Friday I placed bubble wrap between a sheet of laminating plastic and then ironed it between two sheets of baking paper, if I hadn’t used the baking paper the iron would have stuck to the plastic. Once the bubbles started to heat up and melt I was able to run the whole thing through the laminating machine but if I hadn’t had the laminator I could just have continued ironing until everything was bonded together well. I cut one large disc from the plastic and then cut into it in a circular shape working towards the centre. I’m not explaining this very well but probably you know what I mean, once the disc was cut into a swirly shape I could hold up the centre and the rest would fall down as in the picture of the completed mobile! Next I cut out quite a few circles and strung them together using fishing line and little seed beads as spacers. I had the biggest gap between the smaller discs at the top of the mobile (19 seed beads) and graduated the discs so that the larger ones were at the bottom with the shortest string of beads (9 beads at the bottom). 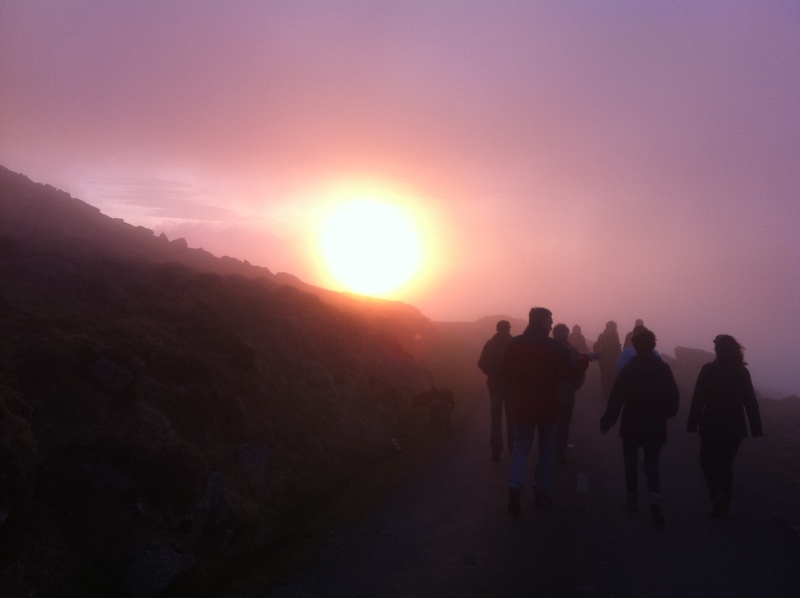 Amazing skies on our walk down from the summit of Mount Leinster! In the evening I participated in a wonderful walk up Mount Leinster followed by a great party at friends Cathy and Martin’s house, check out this picture of the amazing skies we encountered, this is EXACTLY what it looked like!!! Yesterday I felted an iPad cover (it was a commission) while working with Deirdre as she designed and felted her first bag. Working from charcoal Icelandic wool sandwiched between two layers of black merino Deirdre embellished the flap and inclusion of her bag with sky blue fabric, yarn and fibre. There is still about an hour or two of fulling and shaping to go but I am sure you can see how wonderful this bag is from the photo, isn’t it GORGEOUS?? ?